I want to preface this post by stating that this is the best beauty box I’ve ever tried in my life. That’s a big statement to make, but with £100 plus product value for only £19.95 you honestly can’t go wrong with this You Beauty Balance Me Box. The main reason I was so ecstatic when I received this box (it felt like Christmas came early) was because it’s Balance Me – I adore Balance Me. Readers of MIM will know that I am all about the natural skincare. There is not one item in my skincare routine that contains mineral oils, parabens or any other nasties. Skin is our largest organ – we need to give it love! Other than Neal’s Yard Remedies that I’ve written about many a time, Balance Me has quickly become one of my absolute favourite brands. I’ve previously oded about their Smooth & Polish balm cleanser here and I was beyond excited to try their other products. 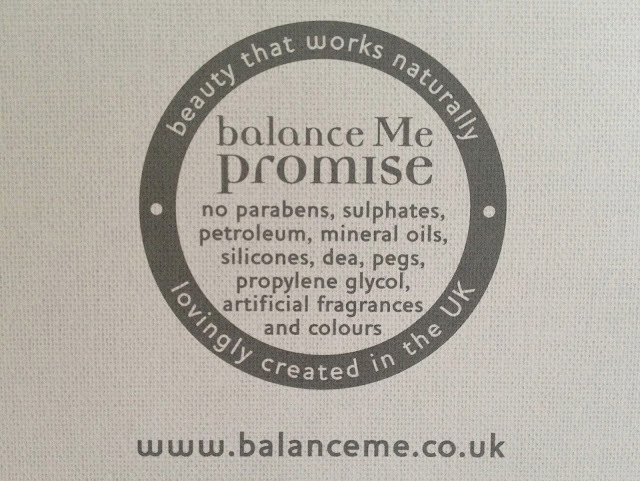 This box also contains a £10 voucher to spend on Balance Me's website! Rose Otto Body Wash - This smells absolutely divine and very luxurious. It really does make shower time a whole lot better! It's very gently foaming and perfect for sensitive skin. Wonder Eye Cream - This is the perfect eye cream for the daytime and night! I love this in the day because it's very light but at the same time so hydrating because it contains hyaluronic acid. It also contains cucumber oil, witch hazel and anti-oxidant rich spruce knot which promise to soothe tired eyes, diminish dark shadows and reduce appearance of fine lines. It reminds me a lot of the Una Brennan Neroli Eye Cream in terms of texture (review coming soon). Cleanse and Smooth Face Balm - Now I've previously raved about this here and I'm so glad this was included in the beauty box, because even though I have the full size this will be such a great mini to travel with! This is my go to face balm for the day and night - whenever I feel like my skin needs to be nourished as well as cleansed. It leaves my skin feeling baby soft and looking really radiant. Super Moisturising Hand Cream - I am so picky about hand creams. I find that after applying most hand creams, your hands are dry again within an hour or so, but not with this one! My favourite hand creams are the ones from Laura Mercier which I mentioned here, but this one from Balance Me has also attained holy grail status! I use it at night before bed and I wake up to the softest hands. Radiance Face Oil - Holy Grail Alert! I am so impressed with this and I absolutely love the fact that it's in a roller ball! I may just keep repurchasing these small ones with the roller ball, because it makes it so easy to apply, and avoids you getting oil all over your hands. By the time you go to rub it into your skin it's already partly absorbed. I've used this religiously for the last few weeks and my skin has been looking very radiant and it's evened out my skin tone. It contains Amazonian buriti nut, rosehip oil, yarrow and benzoin to reduce redness and minimize scarring. I apply this to cleansed skin and add a very thin layer of my Hydraluron serum over the top; together they intensely hydrate my skin and add radiance. This is definitely one of Balance Me's star products. Moisture-Rich Face Cream - This product does exactly what it says! It's a thick cream that sinks straight into the skin and keeps your skin hydrated all day long. It contains a blend of vitamins, lipid and essential fatty acid-rich kukui nut, rosehip and camellia oils. Facial Expression Filler - I've passed this on to my mother since it's better suited to her and she is loving it! It contains collagen and elastin-boosting blackberry leaf extract as well as pure grade hyaluronic acid which firms and lifts the skin, and helps to relax fine muscle contractions which cause expression lines. What a fantastic box from You Beauty! I'm so impressed and would highly recommend this to anyone interested in trying Balance Me products but doesn't know where to start, or for those simply looking for a great beauty bargain! This would also make such a fantastic Christmas present for any skincare junkie like myself!